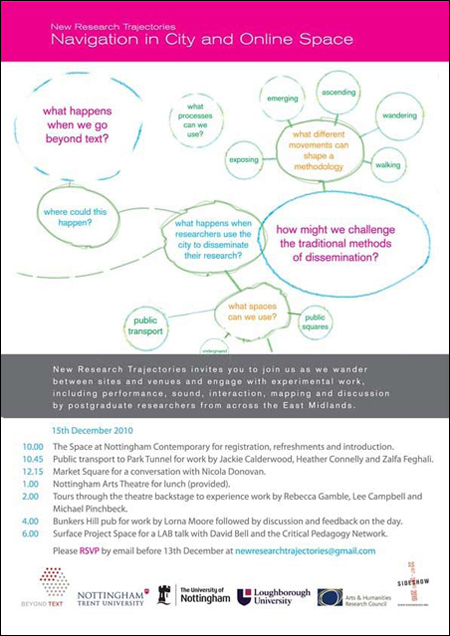 The main event of New Research Trajectories is happening this coming Wednesday, 15 December in Nottingham City Centre, with a range of activities by postgraduate students from universities across the East Midlands. Download the poster and see the website for more information. This entry was posted on Sunday, December 12th, 2010 at 12:18 am and is filed under Posts. You can follow any responses to this entry through the RSS 2.0 feed. You can leave a response, or trackback from your own site.